SDLG wheel loader is top choice for South African tile manufacturer-News-News & Events-Shandong Lingong Construction Machinery Co.,Ltd. Earlier this year, Marley Roofing, a South African manufacturer of high-quality concrete roof tiles, began its search for a new wheel loader to work at its facility in the Ekandustria industrial park in Bronkhorstspruit, 50 km east of Pretoria. The Bronkhorstspruit facility is one of four locations the company runs in South Africa. 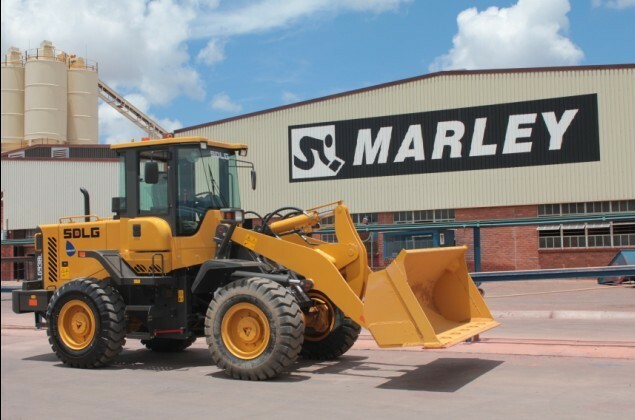 Marley wanted a machine that would provide value for money plus long-lasting performance, and turned to Babcock International, South Africa’s leading distributor of construction equipment, for help selecting the right machine. After considering a variety of options for the demanding daily tasks, the company chose an SDLG938L wheel loader. The SDLG938L, with its 3 ton lifting capacity (1.8m3 bucket)is a replacement for an older machine from another manufacturer. It is also Marley’s first SDLG product and Alf Bartosch, factory manager at the company’s Ekandustria facility, said that SDLG’s reputation for value and quality were the biggest influencers in its decision. The SDLG938L is helping ensure operations in Bronkhorstspruit move smoothly. It is currently loading sand into bunkers and helping stockpile materials on concrete surfaces at the plant. When the LG938L was delivered, employees at the facility were given specialized training by Babcock to ensure they operate the machine at optimum efficiency. Although still a relatively recent arrival, so far there has been no unplanned downtime for the SDLG loader, according to Bartosch. Other customers with similar needs to Marley Roofing have been quick to recognize the benefits of the SDLG brand. Grant Sheppard, General Manager SDLG, suggests that the recent success of SDLG machines is due to their versatility and durability, as well as their cost efficiency. Babcock International is the exclusive distributor of SDLG in southern Africa, and was tasked with helping Marley pick the right machine for the job. Founded in 1891, Babcock is a leading engineering support services organization and an established and trusted dealer of construction equipment, supplying to the energy, process, mining and construction industries throughout Africa.